I am a big fan of sweet beeda.My lunch in restaurants never completes without a beeda.In some hotels , beeda is not served in thali .So we used to roam(me & my father) around in search of beeda shops..Now after marriage,Sendhil buys beeda specially for me though he don’t like it much..Recently my MIL gave me a box of gulkand.Though there are many yummy gulkand recipes , beeda flashed in my mind ;)..But never thought i could make beeda at home until i saw this video. Thank u so much vidya lakshmi.From now on I can have yummy home made beedas happily .This beeda is not only tasty,but also helps to digest food easily. Edible calcium paste is helpful for daily dose of calcium needs..So friends , if u have betel leaves in hand ,try this beeda recipe & let me know ur feedback. I hope step by step pictures gives u a clear idea.Surprise ur guests & elders at home with this beeda after a heavy lunch menu.For a simple beeda recipe , please refer “Notes” section..
Wash the beetle leaf , pat dry with a cloth. Fold the leaf & cut it half way through the stalk part(kaambu) .. Apply less than a pinch of sunnambu/lime on the back side of leaf. pinch. Adding more burns the tongue , take care..
Now roll one edge of the leaf to cone shape..Roll the other edge similarly & make a cone (pouch shape)to keep all the ingredients inside. First add the supari , then keep the dessicated coconut ,pan masala , sweet saunf , gulkand. At last keep a clove & cherries . U can also add a pinch of cardamom powder..Close it. Place a plum on top of beeda & insert a tooth pick OR use a clove to seal it..Serve &enjoy !! To make a simple beeda recipe , wash the betel leaf & apply sunnambu on both the sides.Use supari , saunf , sugar , cardamom powder ,little honey and make beeda as mentioned above..Seal the beeda with a clove.. 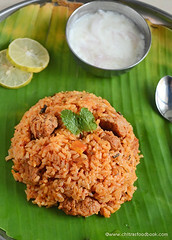 I wanted to post one pot sambar sadam recipe ( Sambar rice in a pressure cooker) after tasting in hotels. Saravana bhavan sambar sadam is very popular in Tamil nadu. I usually make rice and sambar separately and mix them. Every week I used to watch Podhigai channel’s Asathal suvai if it is hosted by “ Mrs.Revathy shanmugam”. Last week she gave the recipe for sambar rice. I tried it the next day.It was a huge success at home.We loved its flavor and taste.I have not used any garam masala here.So It tastes like our Tamil nadu hotel style sambar sadam.It has a goey texture when hot and thickens after it cools down. It tasted great when hot as well as cold. Addition of ghee is a must here. It gives a nice aroma. :) I have updated this recipe with a full video. Please watch it below. Do check out my Karnataka style Bisi bele bath recipe using homemade bisi bele bath powder. Here is my Curd rice recipe. Wash and pressure cook rice.Wash & pressure cook rice n dal along with chopped carrots ,beans , peas ,turmeric powder , salt & hing. Add 6 cups of water & Cook for 2-3 whistles till rice n dal turns mushy.Open the cooker & mash it well.Set aside. In a pan , add a tsp of oil and roast all the ingredients given under “to roast & grind” .Powder them nicely and set aside. In the same pan, heat oil + ghee and saute the onions, chopped tomatoes & curry leaves. Saute till tomato turns mushy. Then add 1 cup of tamarind extract, sambar powder, turmeric powder , hing & salt if required.Let it boil for sometime till onion gets cooked. 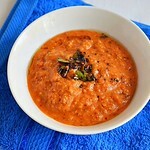 If u want , u can directly add the tamarind extract, sauteed onion, tomato mixture to the cooked rice and dal & proceed. Now add this mixture to the cooked rice . Add the masala powder, drumstick flesh and mix well.Simmer the flame and allow it to boil well for 10 minutes . All the flavour gets into the rice.Stir once or twice in the middle.Add ghee to avoid rice sticking to the bottom of pan.mix well. Lastly temper the mustard seeds & add.Garnish with coriander leaves.. 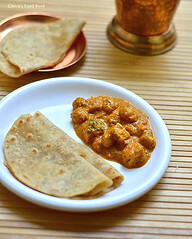 Serve hot drizzled with little ghee & papad !! ! For variations , u can use steamed rice instead of raw rice.Add water according to the quality of rice. I used byadge chillies in this recipe.It gave a nice color to the rice and less spicy too. If you use spicy chillies, use 5-6 as per your taste buds. Adding coconut is purely optional. If you add it, add more chillies to compensate. Delicious sambar sadam, creamy curd rice, crispy fryums and spicy pickle, mor milagai is ready to enjoy ! 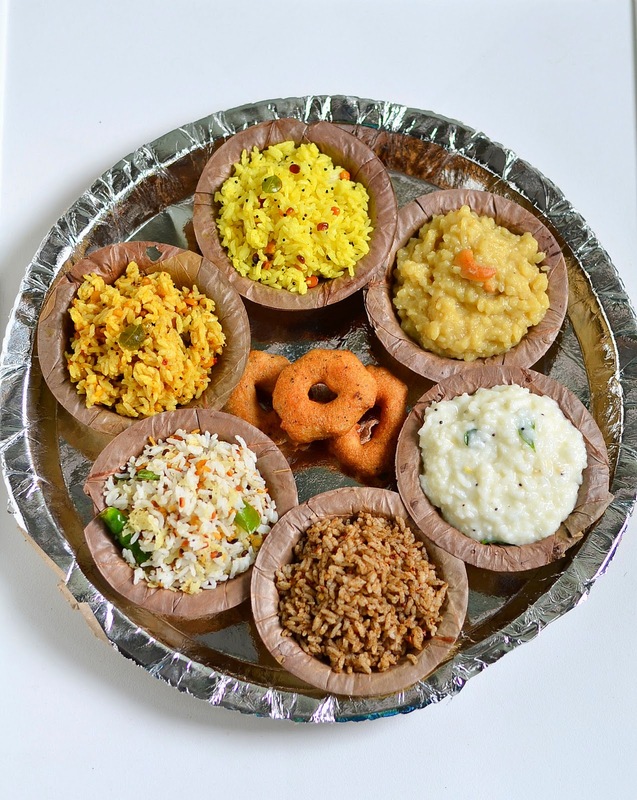 Rava kichadi ( Sooji Kichadi in Hindi) is my husband’s favorite Indian breakfast recipe. 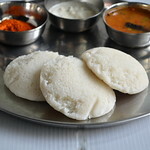 Its one of the most popular South Indian breakfast recipes especially in Tamil nadu and Karnataka hotels.In Karnataka,people call this as “ Kharabath”.I am not a big fan of Rava recipes.To me,rava based dishes are an easy to make,tummy filling food to make in busy mornings. Ideal for Bachelors & working women. So I make it at least once in a week either in busy weekdays or during weekends when we plan for outing. Sometimes I make it directly in a pressure cooker too. Usually I make Rava upma or rava idli recipe but whenever I have fresh peas and vegetables in hand,I opt for this Rava kichadi or my masala rava kichadi recipe. To get the texture & taste of kichadi close to restaurant , we must add the required quantity of water, oil and ghee, otherwise it will be a flop.After so many trials & errors, I am hooked to this recipe.Coconut chutney is the simple and the best side dish for kichadi. 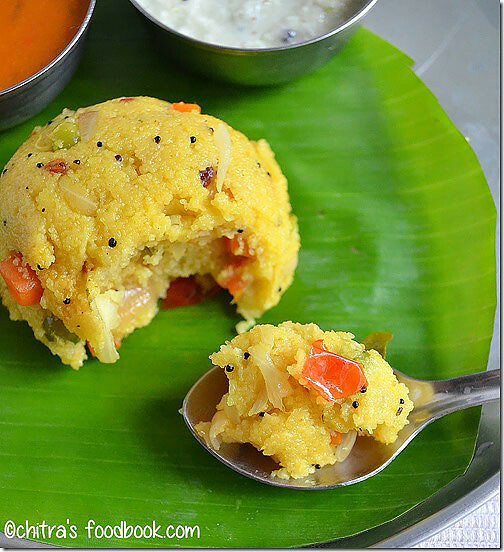 If you make it for your guests along with idli, you can serve it with sambar as well.You could find so many variations for this recipe.Here is my version of how to make Rava kichadi at home. 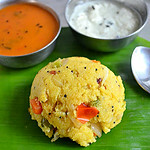 Do check out my masala rava kichadi, Rava Kesari, Microwave Rava Kesari, Milk Kesari, Rava Dosa , Karnataka Kesaribath recipes if interested. Chop the onion,carrot & tomato finely.chop the green chillies finely. In a kadai , heat the oil. Temper mustard seeds,urad & chana dal. Saute till golden brown. Now add the chopped onions, ginger, curry leaves, green chillies & saute till onion turns transparent. Lastly add the tomato pieces & finely chopped vegetables.Saute everything till tomato mushes completely. Now add the rava & roast for 3-4 mins in medium flame.In the mean time, boil 3 cups ( add 3.5 cups for more moist and soft kichadi) of water.When the water starts to roll boil, add it to the rava mixture.Take care, water splashes.Stand a feet away. Add salt, ghee & turmeric powder.Stir well till all the water is absorbed by the rava.Mix well. Close the kadai with a lid & cook it for 6-8 mins.Stir it once in the middle. Kichadi will be cooked completely & becomes non-sticky.Add finely chopped coriander leaves, mix well & switch off the flame. 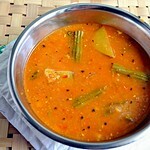 Serve hot with sambar,chutney!Enjoy ! 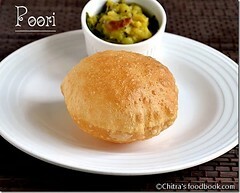 Addition of above mentioned quantity of water , ghee & oil is a must to get the texture & taste. The more oil & ghee , the more tasty it would be.Here I have given the minimum quantity required .So u should add it. You can also add vegetables like potato & beans. If u add beans , pressure cook the beans & then add to rava . Else it wont be cooked. Adding tomato is a must. If u don’t have tomatoes in hand , add little lemon juice at the end. You can also add the water after sauting vegetables, allow it to boil for sometime & then add the rava like we make for rava upma. 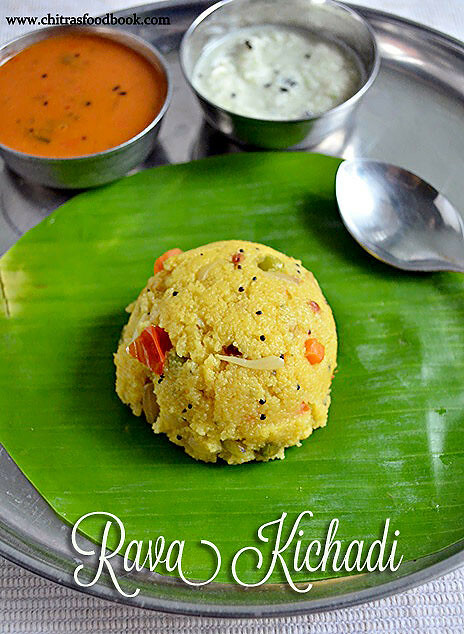 Enjoy this delicious Rava Kichadi with your favorite chutney & sambar !! I wanted to post instant sweet appam with wheat flour (Godhumai maavu appam) in my blog for long time. I learnt this from my MIL. We make this wheat flour appam with jaggery for Gokulashtami and Ganesh Chaturthi. 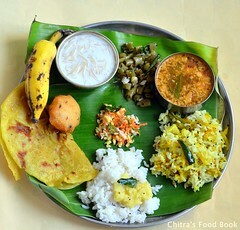 My MIL makes this for occasions / festivals and for guest as evening tiffin along with filter coffee. We can make this appam in two ways. It can be deep fried or shallow fried in paniyaram pan. Today, for Friday pooja, I made this appam using wheat flour and I made it in paniyaram pan. It was very soft , spongy and delicious. My MIL makes a savoury version too. I’ll post it soon. Mostly my MIL makes this appam with maida and very rarely with wheat flour. Enjoy this guilt-free appam as evening tiffin along with bonda/bajji and coffee ! In a bowl , take the banana & mash well. Add the wheat flour ,rice flour , salt , soda , jaggery & cardamom powder. Add the required water to make a smooth paste.Use a whisk for mixing without lumps.The consistency of batter should fall like a ribbon. Heat a paniyaram pan and add 1/2 tsp of oil in each hole.Pour a small ladleful of batter .cover & cook for sometime in medium flame. Flip it after few seconds and again add 1/2 tsp oil. cook for a minute & remove. For variations , u can use maida instead of wheat flour. Sometimes my MIL adds sugar instead of jaggery..
For kids , u an deep fry & give. To get a proper shape while deep frying , keep little oil and pour the batter & fry on both sides till golden brown. U’ll get a nice shape..
Oats pongal is Sendhil's most favourite oats recipes.I have been making this for long time but somehow i din’t post here. He says this is the best among all the oats recipes. I make this at least once in a week. Sometimes I pack this pongal for his breakfast when he leaves early from home.It stays soft for hours. As I make in pressure cooker, I would say this is the easiest and healthy one pot breakfast recipe.But make sure u add lesser salt than the usual quantity because oats needs lesser salt than rice,adding more makes the dish salty. In a pressure cooker base , heat 2 tsp of oil or ghee and add the pepper corns. After it starts to splutter , add jeera ,green chillies , ginger & curry leaves. Saute everything for a second. Then add the moong dal and roast it for a minute.Keep the flame low to avoid burning of spices & dal. Add 2.5 –3 cups of water , Hing ,turmeric powder & salt. After it starts to boil,add the oats.Mix well and close the cooker with the lid.Cook it for 1 whistle in low flame..
Switch off the flame, Open the cooker after the steam is released.U’ll see a layer of water on top of pongal. Again switch on the flame & mix the pongal well till all the water is absorbed. Add a tsp of ghee and switch off the flame. U can make pongal in kadai too but u have to pressure cook the dal separately and add to the oats.I feel the above method easy for me to make everything in pressure cooker. Please adjust the water quantity as per the consistency u need. I always add 1:3 oats & water ratio as my husband likes it mushy and wet. I love Nylon sabudana kheer with sugar a lot. But my husband hates it like anything. He can taste it only if the sabudana kheer is with jaggery. So this recipe appears very very rarely in my kitchen. 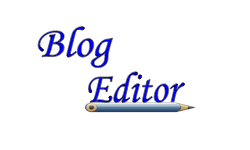 Last week I made this for blogging purpose and enjoyed eating alone ;). It was absolutely delicious and I was happy that I could make it perfect in my first attempt. I asked my mom & mil for making this payasam because they make this payasam instantly by roasting the nylon javvarisi ( small sized sago) we get in Tamil nadu. So this payasam can be prepared instantly without soaking sabudana.I followed their instructions and the result was , a perfect & delicious payasam.I used nylon javvarisi in this recipe. U can also use white big ones known as maavu javvirisi in Tamil. For making this payasam with jaggery using white big sago, please check this link..I used sprinklers for decoration as I dint have cashews in hand . I have used milk and sugar in this recipe. For variations, you can replace them with condensed milk. For rich taste, you can also add coconut milk at the end. In a kadai , add a tsp of ghee & roast the sago till it puffs up & turns white..The size will become slightly bigger. Do it in low flame with continuous stirring otherwise sago may be over roasted & burnt.Alternatively you can skin roasting and make it by just washing the nylon javvarisi thrice and cook in required water. You can also use big, white sago if you don't have nylon javvarisi. But you should wash it twice, soak it overnight adding equal amount of water. ( ie. 1:1 ratio of big sabudana and water). In a bowl, take 2 cups of water and cook this sago till it turns transparent. Keep stirring in regular intervals to avoid sticking to the bottom. Add little more water if needed. It took nearly 10-15 mins to cook.Time may vary..
After the sago is completely cooked and becomes almost transparent , add sugar. Mix well & boil for few seconds. Finally add the milk , cardamom powder and boil for 3 minutes to thicken slightly. Roast the cashews in the remaining ghee & add to the kheer..Serve warm or cold.. This kheer tends to thicken when it cools down.So adjust the quantity of milk accordingly. For variations , you can add milk in the sago after its 90% cooked. Cook till done and then add sugar, cardamom powder and nuts. By doing this way, payasam tastes rich. U can also add 1/4 cup of coconut milk before switching off the flame and it make this dessert more tasty. If you want to soak the sago instead of roasting, soak it for 2 hours if nylon variety & over night or around 12 hours for white big ones.. 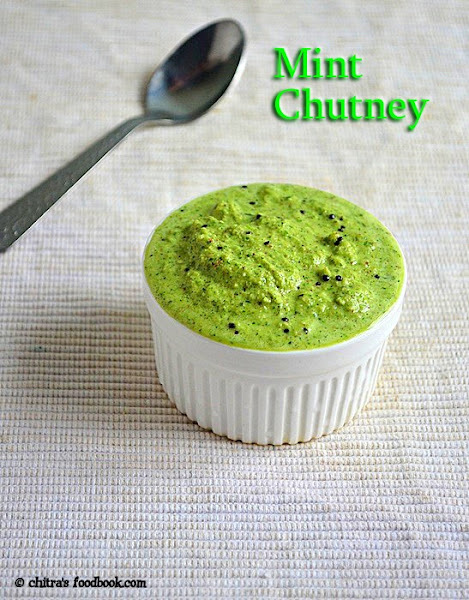 I make this mint chutney recipe(Pudina chutney in Tamil) for breakfast. 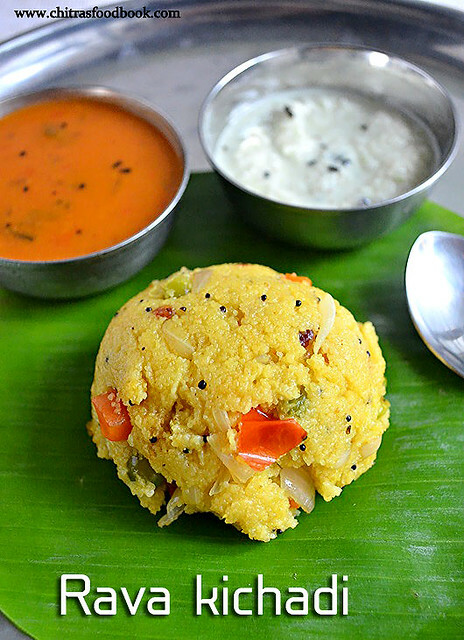 Its a very tasty side dish for idli dosa. 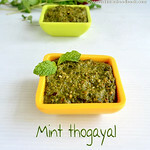 I have already posted a mint chutney with tomato and this one is with coconut.Sendhil & Raksha love this chutney a lot. It tastes more like hotel chutney. As this is a two step recipe, I have not posted step by step pictures.For step by step pictures,please refer my Green chutney recipe using coriander leaves if interested. In a kadai,heat oil,saute the green chillies,mint leaves,turmeric powder,small onion, garlic cloves,tamarind and fried gram dal.Lastly add the grated coconut ,saute for a minute & switch off the flame.Grind everything together adding the required salt & water. Temper & add them to the chutney bowl.Mix n serve ! For variations,u can try without sautéing coconut. Addition of turmeric powder& sautéing mint leaves gives a nice green color to the chutney.Please don’t skip it. You can grind everything raw and temper the chutney. 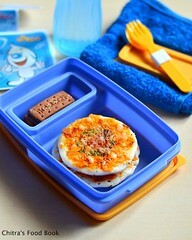 Serve with idli,dosa topped with gingely oil ! !